The All New, All Daring Delusional Honesty! : Incredible Hulks #614: Blast Off! Howdy, folks! I'm back from my great trip east to New York Comic-Con. It was great--maybe I'll even tell you about it someday! For now, thrill to this review of the latest issue of The Incredible Hulks! Next week you'll see a belated Chaos War review as well as an exciting look into Greg Pak's new creator-owned project, Vision Machine. Hang loose, true believers! "Dark Son, Part Five: Blast Off"
What's this, you say? The cover of this issue states we're on "Part Three of Six," and yet, the title of this story clearly states we're in part five! How can this be? Well, if you haven't been reading the Hiro-Kala stories in both of the previous issues, shame on you! Both #612 and 613 featured two parts to the ongoing saga of the Hulks and their perilous collision course with Skaar's mad brother. 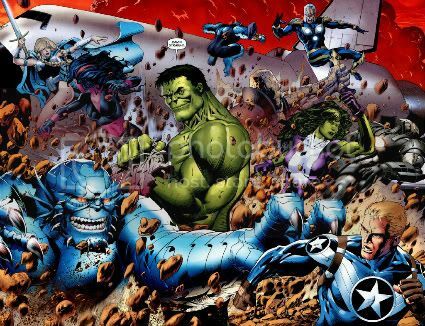 Although the last two issues were largely prologue, bringing more casual fans up to speed with all facets of recent Hulk history, this fifth part kicks the storyline into high gear with a battle between the Hulk's "family" and the Secret Avengers. It also features the debut of British artist Barry Kitson of Legion of Super-Heroes fame. So, how does this part of the saga measure up, now that the team is set to encounter Hiro-Kala? Honestly, at this point, we're halfway through "Dark Son," and we're still hung up on the set-up. The final three issues had better be a slam-bang battle the likes of which have seldom been seen in this title. It's not that the set-up is bad, quite the opposite--but it still leaves one with a feeling of "are we there yet?"-ness. It's methodical, more than anything--first writer Greg Pak established the Hulk family, then the backstory of Hiro-Kala. Then Earth's heroes discovered the threat, and the Hulk didn't care, but then he found out the true nature of the threat. Here he comes needing a way to meet the threat, which leads him and his family into conflict with Steve Rogers and his Secret Avengers. Finally, at the end of this story, I don't think I'm surprising anyone when I say that the Hulk family appears to be headed to finally meet the conflict head-on. We hope. The key concern I have with this new status quo more than what's in this storyline is that, when you break the story down, it's still predominantly a story about the Hulk, and not a group of Hulk-like individuals. 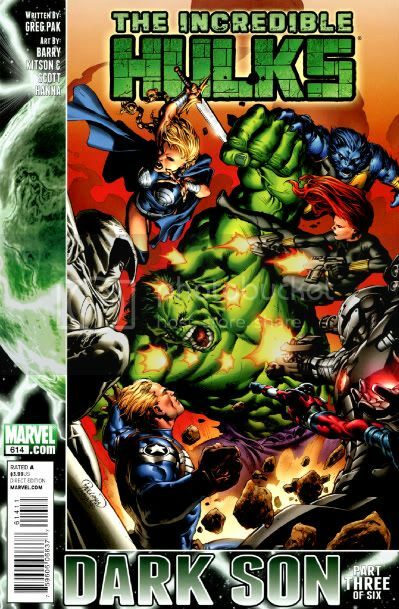 Seriously, although there are six "Hulks" in this story, only three have had any substantial role in the story to date. It's been a tale about the Hulk, his ex-wife, and his son by his alien queen. It's not a story that is inclusive of A-Bomb, Jennifer Walters, or Korg, as is shown by their painfully minimal presence in the script. Oh, sure, Rick as A-Bomb gets a few lines in, but Korg and Jen? Not a line of dialogue, not a meaningful part to be played except to fight some Secret Avengers who themselves similarly barely have any lines. It's largely the same role as they've played in the previous two issues, and I'm getting to the point that I wonder if there's really some point giving the book a title it has barely managed to earn three issues in. If I read a book titled Fantastic Four, all four heroes do their part, and if I read the X-Men, the full team line-up that month has a pretty integral role. Why, then, do we only see about 50% of the Hulks do their thing in any given issue of this book? Luckily, the Hulk has a nice, meaty part in this story, with he and Banner showing why they are who they are. Greg Pak has such a natural feel for both characters, it's hard to imagine why other writers have historically had such a problem with the dual personality. I must also give props to him for the Hulks' means of transportation--let's just say it should bring back pleasant memories of World War Hulk. And the art, oh, the art! Barry Kitson's first double-page spread (there are three!) is terrifically evocative of the "Planet Hulk" storyline with the Hulk tearing through the side of a ship. His artwork is wonderfully evocative of Sal Buscema in parts without slavishly copying. I've waited for many years to see Kitson draw the Hulk, and with this issue, I'm not disappointed in the least. So, the story? Not bad, but I want to see Pak kick it up a couple notches next issue. The art? Absolutely astonishing. I'm very glad the next part is only two weeks away.